…plus the Earnest Sewn sample sale and the ultimate Woodstock 40th Anniversary boxed set. 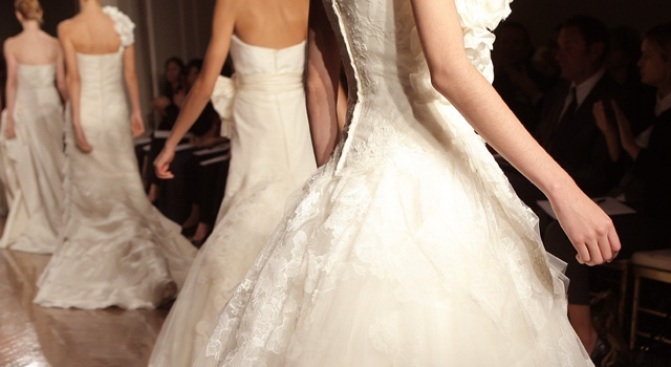 Vera Wang's inimitable bridal styles are on sale up to 80% off. WHITEWASH: Brides-to-be, start your engines: The Vera Wang sale you've been waiting for -- the one where wedding gowns are slashed up to 80% off (as are cocktail and other dresses, but really, who cares about those?) -- begins today. 6/9-11; 225 West 39th Street at Seventh Avenue, 9th floor; (212) 920-1211. SEWN UP: Earnest Sewn's everyday denim prices are kind of splurgey by today's recession standards (paying $300 for jeans is so 2007, no?). During the brand's sample sale for men, women and kids, those numbers drop precipitously: We'll be snapping up some jeans for about $70. Through 6/14; 260 Fifth Avenue at 28th Street; (212) 242-3414. 40 AND FAR-OUT: Released today, the 40th Anniversary Ultimate Collector's Edition of Woodstock: 3 Days of Peace and Music: The Director's Cut on DVD is hours and hours (and hours) of the concert-happening that changed the world for $41.99. This box set includes more than three hours of extras -- rare footage, interviews with the likes of Mart6in Scorcese, and so on. Mud sold separately.